I fell in love with cars by accident. As I started my sophomore year at Liberty High school, I realized I needed to find a class to replace one I had dropped. The only class available was an Automotive Technology class. I walked in not really knowing what to expect, but after the first week I was in heaven! This is when and where my interest in cars began. They offered an Automotive Technology I, II, and III and I took advantage of all of them, becoming the instructor’s aid my senior year. Following high school, I attended Ranken Technical College in Wentzville, MO where I received my Associates degree in Technology – Automotive Maintenance. 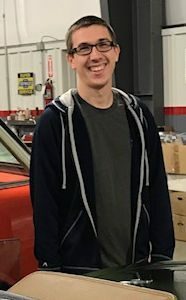 During my time at Ranken working more closely with different cars, I knew I wanted to find a career restoring classic cars.